← William E. Wynne Sr. turns 88 today. I am up visiting Mom and Dad here in NJ, and I stumbled over this photo from 2000 at Brodhead. It is the perfect one for me to share an important safety lesson for all Pietenpol builders. I have pointed this out many times in the last 10 years, but very few people have paid much attention. It is important, and I write this hoping to get a few more people to reconsider these points. 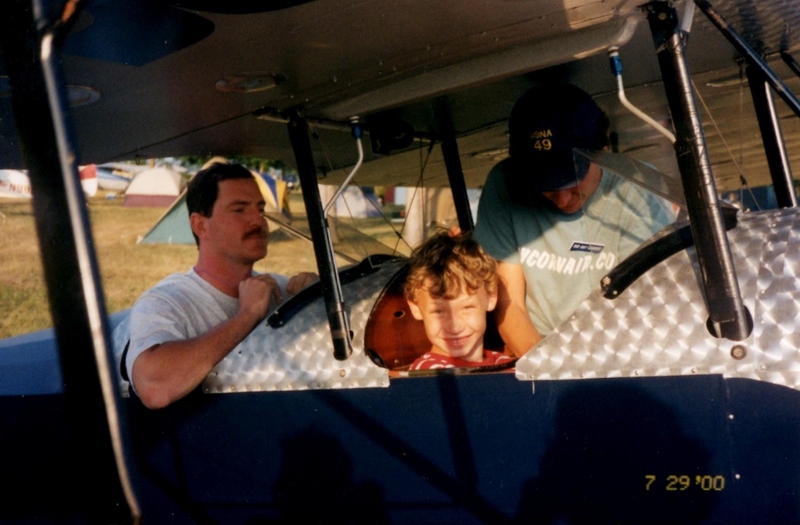 Above, I buckle in my seven year old nephew in the front seat of my Pietenpol for his first light aircraft flight. This is Brodhead 2000, a long time ago. (Matthew is 6’4″ and a senior at Duke today.) The guy in the cockpit is Arnold Holmes, Long time friend and local host of Corvair Colleges #17, 25 and 29. This aircraft, N-1777w, was destroyed in a crash in July 2001. This photo clearly shows two details that no Pietenpol builder should have in his aircraft. Looking at the photo today, I cringe at the very idea I put a child in this seat, that as an experienced builder I didn’t see what could happen with this arrangement. While I am not happy that a friend stalled/spun the plane, I am morally thankful that I, and not one of 100 passengers the plane flew, that ended up covered in burns and grafts. I have made 3 serious mistakes in my life that I live with, but do not forgive myself for. I understand this kind of weight. Speaking just for myself, I could not carry the burden of someone’s kid or wife being harmed by a part on my plane I was too lazy or cheap to make better. The two issues here are the fuel lines and the diagonal cabane struts. The design’s four vertical cabanes made shifting the wing forward and aft to fine tune the CG possible. But, in a crash, this works against you, and the inertia of the wing assembly and the fuel in the tank provide tremendous force to displace the wing forward. The only serious thing resisting this are the diagonal front cabanes. If they are built to a size like 1/2″ x .035″ tubing, they will work great in flight, but fold like cooked spaghetti even in a small accident. When this happens, if you have the wrong fuel line or clamping on it, the person in the front seat can get covered in gasoline, just as they are trapped by the collapsing cabanes. I know this from personal experience, and I have since studied other Piet accidents, and this is a common thread on aircraft with light diagonal cabanes. I have had people with flying planes and small diagonals say to my face “It will be alright.” Weigh that against my 5 years at Embry-Riddle studying aircraft structures and accident investigation and my 3 square feet of skin grafts and decide who you are going to listen to on this. If you are new to homebuilding, let me point out that people who utter the phrase “It will be alright” don’t actually believe this 100%, they know what they are doing is foolish, but they say the phrase aloud like a mantra they are hoping to indoctrinate themselves with. Listen for it, you can hear it at any airport on any Saturday in any state. If you follow anything that person later says, who are just listening to a lullaby and going to sleep while you are on watch. Roman legionaries who fell asleep on watch were put to death. In the last 2,000 years the world has become more forgiving of laziness obstructing vigilance, but flight is a throw back, with more in common with the days of Julius Cesar. Deciding that you are just not going to care about these details on your own plane is the eqilivent to letting out a real big yawn when you are on guard duty. In the photo, you can see the diagonal cabanes on my plane were 5/8″ diameter, with small adjustable ends. This is bad. The minimum size I would use is 7/8″ x .058″, and these need to be welded to the front verticals, not bolted, and really not bolted in with flattened ends like a 1960s swing set. Welding will preclude making later CG adjustments, but I have already taken away this excuse by doing the weight and balance on electronic scales on 30 flying Pietenpols and publishing this in a 5 part series in the Brodhead Pietenpol newsletter. The data was for everyone, not just Corvair builders. If you would like an example of welded cabanes, search our site for pictures of Dave Minsink’s Piet. Upgrading like this will not make you immortal, but it will be a huge increase in safety in a survivable accident. Second, the fuel lines: My plane did not have a fuel tank in the center section; instead it what is called a ‘wet wing’, where the center section was the fuel tank. The structure was wood and fiberglass, and it held almost 18 gallons within the standard airfoil shape. To get it to completely drain and be 100% useable with the Piet’s under cambered airfoil, I made the 1.5″ x 2″ x 24″ sump seen on the bottom of the wing. This was made from 8 layers of vacuum bagged glass. I know what I am doing around composite materials, and this did not rupture nor leak when the plane hit the ground. We are not speaking of a light hit either, the impact drove the left front gear leg through the floor and came up so far it sliced the underside of my chin. The wing parallelogramed the vertical cabanes until the gap I slithered out of was about 10″ high. It took me about 1 minute to get out. What covered me in gas was the two 3/8″ aluminum hard lines being stretched and broken just below the blue AN fittings. The displaced vertical cabanes and having the hard lines tapped to them was the cause. In the photo there were just a few passes of tape on them, but on the accident day I had them taped for about 12″. It looked neat and clean, but it was a bad idea, just like when people use steel or aluminum clamps. The diagonal cabanes needed to be bigger, the fuel line need to be a real braided steel AN flex line (not a rubber hose) and it needed to be secured with light, weak, plastic zip ties and have some slack in the system. I got out of the wreckage by a very small margin. If the gap was 1″ narrower, or I was 10 pounds heavier or wearing a bulky jacket, I would have been trapped. Sliding out, the two open lines poured a steady stream of 100LL on me. The pilot was knocked out cold for a minute, and was uselessly groggy for several minutes. Although there were people standing there, no one approached the plane, and I dug Jim out by myself. I wasn’t really cognizant of being soaked in gas, but I do remember being very cold from it evaporating. I got Jim out of plane and 100 feet away before the plane ignited, but I had left a vapor trail in the grass that led right to me. It took only 40-60 seconds to do the damage. Rolling on the ground does not put out fuel soaked clothes. Giving in to panic, I was getting up to run, but was fortunately caught by Jim who tackled me smothered the flames. This is an accident that no one need to repeat. What do I hope to accomplish by sharing this story a week before Christmas? I was just thinking that there may be 3 or 4 guys who read it who live in cold places and have hangared for the winter decide that this is the winter that they switch to stouter cabanes, or make a better fuel line arrangement. Maybe a few guys building will review the CG articles, calculate their own fixed CG from the examples, and them build welded cabanes. Will many people switch over to something better? Experience says that most people will just look at their small diagonals and hose clamps on old non-ethanol rubber fuel line and say “It will be alright.” I will attend Brodhead and hear people talking with great vigor over crap that doesn’t matter like Latex paint vs Stitts, (they both work) How much better a plane 50 pounds lighter glides (all planes have the same glide ratio at gross as they do lightly loaded) and how much better Riblett airfoils are (they are about the same). All the while I will see people with planes flying 2″ out the aft CG limit, with tiny cabanes, welds that look like painted over old chewing gum. I have no explanation for why people want to debate things that don’t matter, while ignoring things that do. If you can figure it out, you are a better man than me. I just try to say focused on things that I can control, like my own work and what I choose to fly in. I turn 51 next week, and I figure I have 24 flying seasons left, give or take. I have many things still to build and many places to fly and friends to see. There are worthy of real effort and thought, and spend very little time worrying about why most people don’t care enough. -ww. Thanks William for that incredible story of survival and what a person can do to lessen the odds of becoming a statistic. This is the year I’m taking your story to heart and installing braided fuel lines in my 601XLB. I know I have been foolishly saying to myself what you suggested but no longer. I’m going to lower my odds this spring when I get back to NC. Thanks again. Thanks once again for sharing your experiences with all of us. Your willingness to share your ‘not the best’ ideas as well as your best helps all of us. When you say that you want to help builders and then share with everyone mistakes you have made, it just further validates that desire to help. It takes real strength of character to share failure as well as success. Thank you. In building my fuel system I have thought a lot about your experiences. I want to use braided fuel line and a welded aluminum tank. Would breakaway fittings like the ones the link shows be a good idea? We had them in aircraft I flew in the Marine Corps and thought it might be an idea worth considering. Thanks for your thoughts on the subject. Well, William , I turn 70 this week and plan to have 24 more flying seasons myself. Working the email down from the top, I found this even more poignantly written message re Piet fuel lines and cabanes. Sorry you had to pay such a price to save the rest of us, glad no one else did in your plane, and glad you lived to tell about it. Happy Birthday! Will join you in celebration the next week, 1/4, as I finish the 71st orbit. Ditto, Gary Burdett!